This is the first in a series of articles dedicated to Automotive Upholstery for Beginners. In this series we'll take you through the basics and show some projects that will hopefully help in your classic car restoration efforts. We can't cover all upholstery techniques, but with the understanding of the basics you should be able to tackle many sewing and upholstery related tasks. This first installment discusses the "hows" and "whys" of machine set up. In a gathering of Do-It-Yourself (DIY) car guys (and gals) discussing auto restoration, they most likely would be talking about things like engine rebuilding, suspension, panel fabrication, painting or electrical systems. Mention upholstery and watch their faces turn from enthusiastic to frowns. A typical response is "Oh, I'll just purchase a kit for that." Of course that's great when a kit is available for your model, but what if your project is old or exotic enough that an upholstery kit is not available. You're stuck. Then you have three choices: reusing the original upholstery; tackling it yourself; or sending the car out and paying a professional. Granted a professional may have many years of experience and likely could do the job faster and with a degree of quality better than a beginner. But that service comes with a price. It's not hard to imagine that getting your project restored to this point may have stretched your budget, and adding another $5-10K or more isn't possible. There are many books about upholstery available. In each, the author presents the material, covering subjects that he thought was important and often the book is geared toward a certain era. That's not a bad thing. But what they often miss is a thorough explanation of the basics. Those interested in rounding their restoration skills by learning upholstery, this series is intended for you, starting with the fundamentals. Machine Head The sewing machine unit (referred to as the Head) sits in the table typically with two hinge points at the rear and the weight of the Head provides tension to the drive belt. This JUKI unit is a well known Japanese commercial brand (Photo 1). It is called a compound walking foot (more on that later). The table height can be adjusted to fit the operator. Photo 1 Overall view of a JUKI brand sewing machine (called the head) installed in a special table. 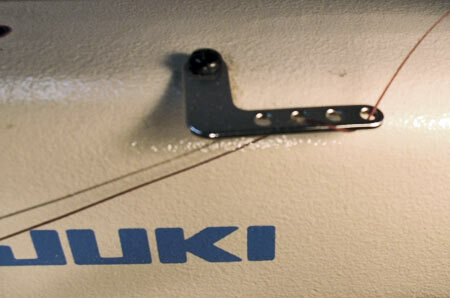 JUKI is a Japanese built machine and is well known in the upholstery trade as a high quality machine. Note the light on a gooseneck arm to put light where it's needed. The table is special as it has adjustable height, includes hinges on the back of the motor head to tilt it backwards to access the bobbin and clean the bottom tray. Other features are the hand wheel on the far right, the reversing lever (horizontal bar on right), bobbin winder on right, and needle on far left. 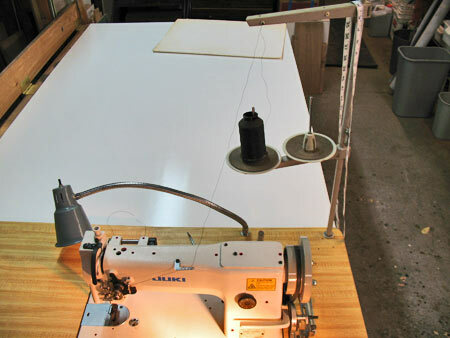 Notice that the table and machine are located against a long table used to catch the material as its being sewn. Under the table are attached the motor, clutch, knee lift and treadle. Motor The electric motor under the table runs at a constant speed and uses a side slip clutch (Photo 2) to drive the pulley and belt to the Hand Wheel. Motor speeds can be 1750 or 3500 RPM. 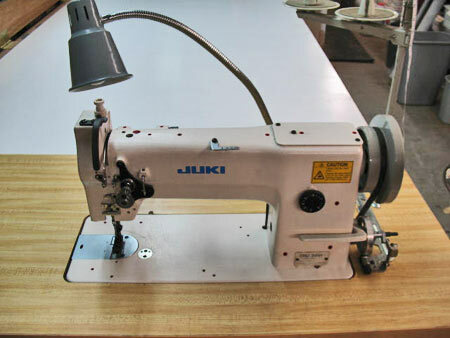 Beginners should select a machine with a motor at 1750 RPM to get better acquainted sewing at a slower speed. One suggestion, a pulley and belt arrangement can also be included for further speed reduction (Photo 3). The belts can be later arranged to speed up the machine speed when you feel comfortable stitching at the slower speed. Photo 2 The sewing machine motor is a heavy unit which operates at constant speed. Most motors run at 1750 RPM but certain machines can be configured with 3500 RPM motors. 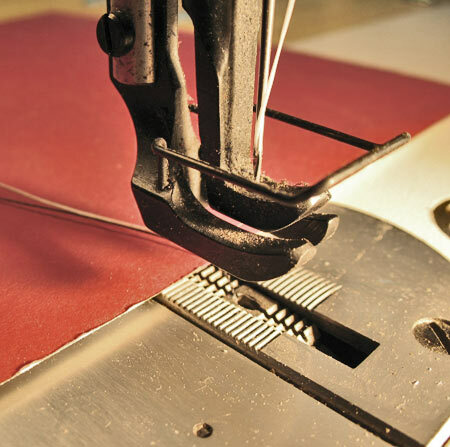 The faster motor should be avoided when purchasing a machine for the beginner upholsterer. On the right side is the side slip clutch with a spring tension adjuster. Below the motor is the clutch lever that engages and brakes the machine. The threaded rod is used to adjust the tension to the belt pulley. Photo 3 This belt and pulley arrangement was installed to intentionally slow the motor's speed to the machine. As configured, it slows the 1750 RPM motor to about 1,000 RPM and if needed the belts can be slid to different pulleys to raise the speed. The pillow blocks, shafts, belts and pulleys were purchased from McMaster Carr and Grainger. Treadle The treadle is the foot operated platform that drives the motor's clutch. 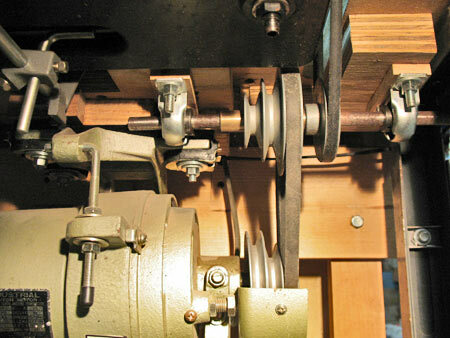 Using both feet, pressing the treadle forward (rotating forward & down) engages the machine and using the heel backward disengages the clutch and applies a brake to stop the machine (Photo 4). After a while, you will learn the sensitivity of the treadle: when the clutch engages to operate the machine at either a slow stitching speed or at full speed but for short bursts. 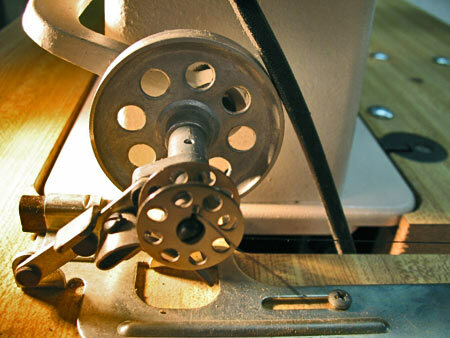 There are position and spring tension adjustments associated with the treadle. Take the time to adjust these to suit yourself. 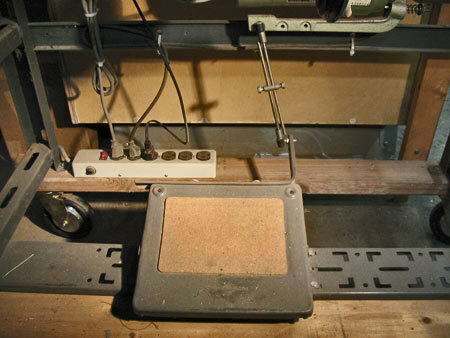 Photo 4 The treadle is a foot actuated platform that engages the clutch. Pressing (more like rotating) the feet forward engages the clutch and pressing backward with the heels applies the brake. 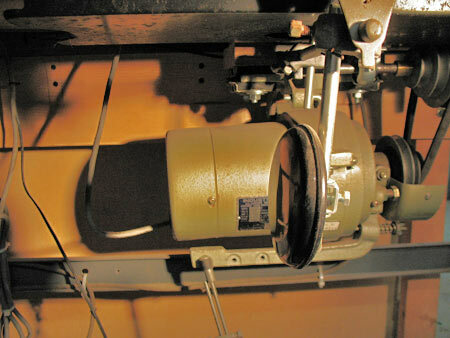 The brake is applied when the operator needs to reposition material to be fed into the needle or when pivoting. Note the different positions the tread rod can connect to the clutch arm and the two locking nuts that adjusts when the treadle engages and brakes the motor. Knee Lift The Knee Lift provides the same lift action as the Presser Bar Lever, but using the side motion of the operator's right knee (Photo 5). This is handy when having to move or rotate the material with the needle is down to raise the presser foot and pivot the material and doing so rapidly. It may seem awkward at first, but once accustomed to its operation, the value of the knee lift will become clear. Photo 5 The knee lift is a lever actuated mechanism that raises the presser and needle foot, but not the needle itself. Just as the name implies, the operator's right knee is pushed sideways to raise the presser foot. 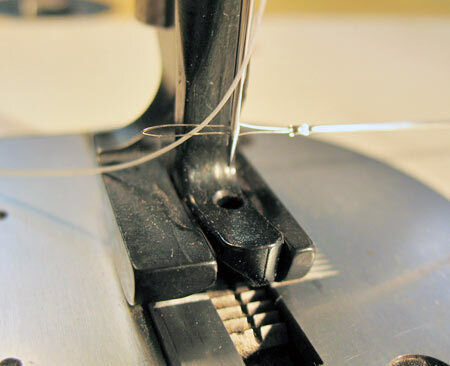 There are parts of sewing a stitch that requires the needle to be all the way down (thus anchoring the material) and pivoting it around. The knee lift allows the operator to take pressure off the material while using both hands to hold onto the material and making the pivot. Hand Wheel This is an approximately eight inch diameter wheel on the right side that the operator can rotate to move the needle and/or raise the presser foot into position (Photo 6). The Hand Wheel also connects to the drive belt to the motor underneath the table. Only rotate the Hand Wheel forward, never try to turn it backward. Photo 6 Shown are the Hand Wheel and Bobbin Winder parts of the machine. A drive belt from the motor loops over the wheel to operate the machine, but can also be rotated by hand for beginning a stitch or when turning a corner. Having the position of the treadle in the middle (neither clutch or brake is engaged) is required to operate the hand wheel. Rotate the hand wheel in the forward direction, never try to turn it backwards. Bobbin Winder The Bobbin Winder is the attachment with the wheel and shaft on the right side of the machine (Photo 7). The Bobbin Winder includes a thread tension adjustment at the back. Thread is pulled up from the cone, over the loop and down through the hole on the winder through the tension disks (Photo 8) and onto the bobbin. This provides constant tension to the thread as its wound onto the bobbin. The winder, when adjusted properly, flips down so that the wheel touches the drive belt and spins the winder. The winder also includes a thin metal strip (like a finger) (Photo 9) just above the bobbin that senses when the bobbin becomes fully wound. It will then automatically flip the winder up away from the drive belt (Photo 10). 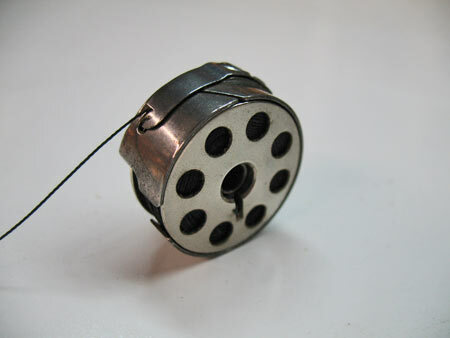 Wrap the thread onto the Bobbin several times by hand before slipping onto the Bobbin Winder shaft. Eliminate any excess slack before running the machine. When winding a bobbin, never run the machine with thread and always with the Presser Lever up to lift the Presser and Needle Feet. Since this takes some time, wind several Bobbins in advance with the color(s) for your project. Photo 7 Mounted to the table and next to the drive belt is the bobbin winder shown with winder wheel (larger diameter wheel) touching the belt. The bobbin is slipped on the winder shaft. Photo 8 Close up view of the bobbin winder tension disks. The thread is routed from the cone (located above the machine), through the hole on the bracket, in between the disks and back to the bobbin. Turning the thumb screw in puts more pressure on the disks and thus increases the tension of the thread as its wound onto the bobbin. Photo 9 Since the bobbin winder's wheel is snapped into place against the drive belt, when the machine is engaged, it will wind the thread onto the bobbin. The little metal finger is positioned in the bobbin so that it that will sense when the bobbin gets full. 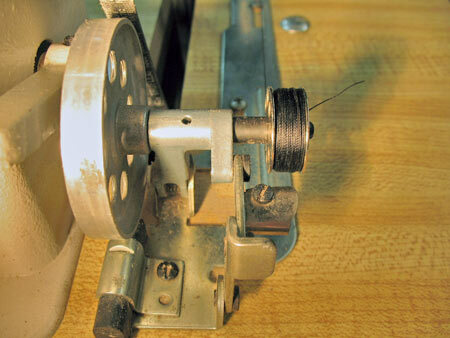 Photo 10 Shown is what happens when the bobbin is fully wound, it will snap the winder off the drive belt and stop. Since the bobbin winder is used when the presser foot is in the up position, it is advised the wind several bobbins of the each color thread required for your project. Bobbin The Bobbin in a sewing machine contains the thread that makes the bottom of a stitch. Bobbins are wound with a type and color of thread appropriate for the your project. The Bobbin is placed in a cylindrical housing called a Bobbin Case or Bobbin Shuttle (Photos 11, 12 & 13). The Bobbin Case includes a thin metal band with a small screw to adjust the tension of the thread coming out of the Case. Bobbins can be oriented with the thread exiting the Case in the direction of the adjuster band or flipped over to exit the band opposite to provide a greater range of tension. Photo 11 A partially used bobbin removed from the bobbin case. The case is essentially a shell that holds the bobbin, allowing it to spin freely. Photo 12 A fully wound bobbin inserted in a bobbin case and the thread is routed counter clockwise (left) first into the slanted slot and then under the metal tab as shown. 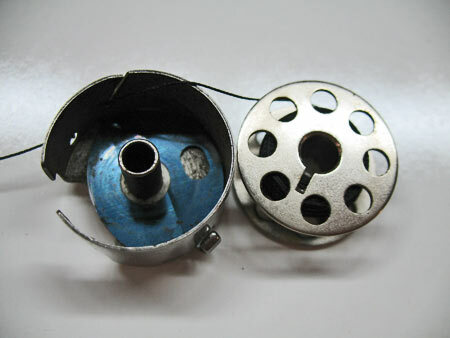 The metal tab provides extra tension on the thread as it is released from the bobbin case. This tension can be adjusted by a small slotted screw just out of view in this photo. Once set, it almost never requires adjusting. When inserting back into the machine, leave a tail of 3-4 inches. Photo 13 View of the machine head tilted back onto the table showing the bobbin case. The thin lever in the middle of the bobbin case is a locking clasp. It is folded back whenever removing or inserting the bobbin & case. Reversing Lever A Reversing Lever or Control (Photo 14) is used to temporarily reverse the direction of the stitch. 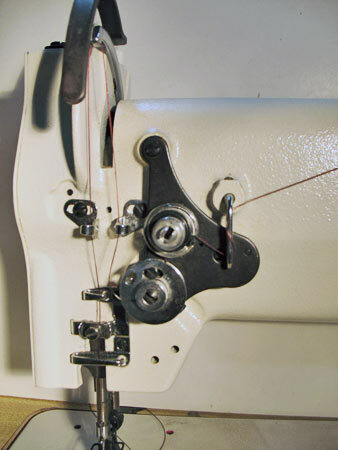 You cannot perform a reverse stitch by turning the Hand wheel backwards. 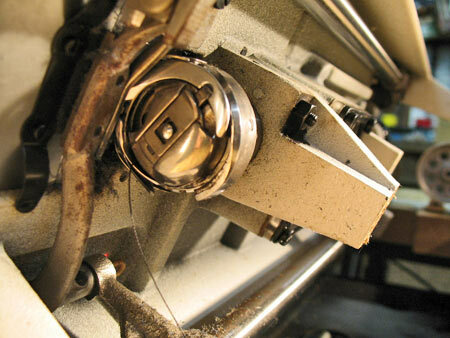 The reverse is used to make lock stitches and only operates in reverse while pressed down. 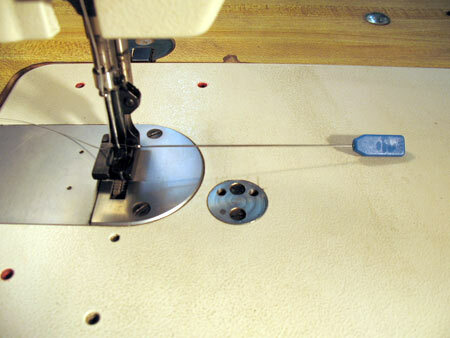 When not pressed down the machine will automatically run in its normal forward-sewing operation. Photo 14 The horizontal lever on the right side of the machine is the reversing bar. 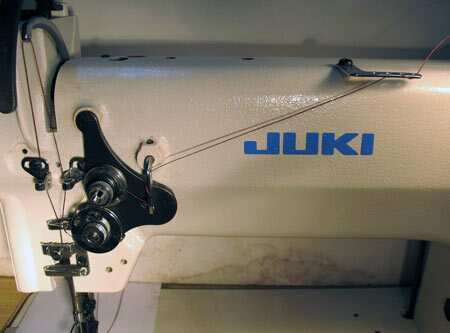 Not all sewing machines include this feature, but is somewhat common on commercial machines such as this JUKI. Presser and Needle Foot The Presser Foot (Photo 15) is sometimes confused as being the entire assembly on the left side of the machine over the shuttle cover where the needle passes into the Feed Dog (see Feed Dog below). The two feet are two different components; the Needle Foot (that the needle passes through) and the rest of the Presser Foot. They operate independently of each other. Each foot can have different shapes and configurations depending on the task at hand. A piping foot is quite different than a zipper foot and that is different than a regular foot. Photo 15 Shown is a close up view of the Presser Bar Foot (left and right of the Needle Foot), the Needle Foot in the middle (easily recognized with the needle running through it), and the Needle itself. Note the Needle Foot is free to move independently (up and down and front and back) of the Presser Foot. Coming through a slot in the bottom plate is the Feed Dog, the serrated teeth that pull the material through the machine as the stitches are formed. With each stitch, the Feed Dog lowers, moves forward, raises and pulls the material forward so that the next stitch can be made. This is the main motion which gives this machine its name, a Compound Walking Foot. The thread is routed down the left side of the needle and note the groove in the side of the needle. Its this groove that the thread with travel in while the needle pierces the fabric to make a stitch. Presser Bar Lever The lever behind the Presser Foot (Photo 16) lifts both the Presser Foot and Needle Foot to permit material to be aligned under the feet and needle. Motion of the Presser Bar Lever is the same as the Knee Lift except the lever will keep the feet up. The Presser Foot Bar (lever) should be in the raised position when accessing the bobbin under the shuttle cover or when winding bobbins. The feet should be lifted off the machine's base unless there is material under the feet. Photo 16 The Presser Bar Lever (accessed from the back of the Presser Foot) raises and lowers both feet, but not the needle. 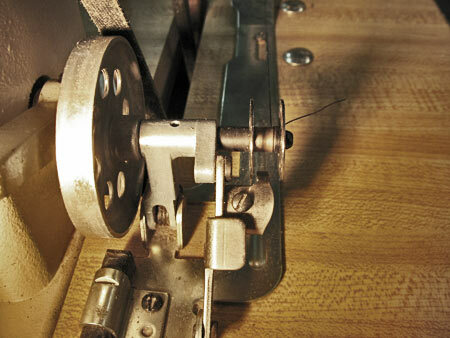 The Presser Foot is raised when using the bobbin winder or when positioning material under the foot and needle. Needle The needle connects to the needle bar above Feed Dog and Presser Foot. The needle is held in place by a small set screw and has a specific orientation determined by the slot on the side of the needle. On our machine the slot is on the left side. When making stitches, the thread will travel inside the needle's slot (groove) and the thread is routed only to the left side of the needle. Needles come in various sizes to match the thread size and it's important to purchase the right size for your project. Needles are usually sold in packs of 10 or 100, so don't be afraid to order a bunch of extras. The tips of needles can be regular round, slightly round, sharp round, triangle point, diamond point, and even blunt depending on the material being stitched. In general, a sharp round point can pierce and stitch cloth material where the triangle/diamond point can pierce vinyl and leather material. The Schmetz Needle chart shows the different needle sizes in older and more current terminology. Feed Dog Metal grippers under the needle (Photo 15) are that pull the material through for each stitch. 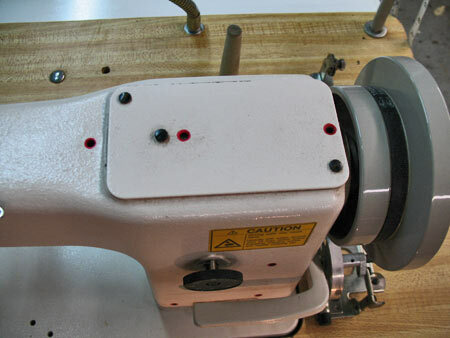 * Thread Routing to the Tension Adjuster â€“ Thread Routing (Photos 17 & 18) begins with the cone of thread on the cone holder. Thread is pulled off the cone, fed through the holes in the horizontal bar and down to the machine. 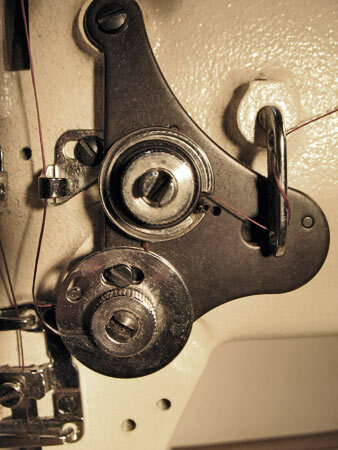 Thread coming off freely is necessary whether the thread is going to the machine or the bobbin winder. Thread should come off the cone easily. The first thread routing part is the small horizontal bar in the middle of the machine. Only one loop is usually needed here (Photo 19). This keeps the thread from flying wildly and puts some tension on the thread during each stitch. Photo 17 Threading the machine varies depending on brand or model of your machine. However, it still follows some common principles. Thread in the form of a large cone is mounted on a platform with a horizontal bar above it to draw the thread. The thread can be routed to either the bobbin winder or the machine head. A lamp on the goose neck arm puts light where you need it, (usually at the needle), and the sewing machine table is against a generous table to take in the material as it sewn. Note the cleanliness. Upholstery work areas should be free of any dirt, shop dust, and liquids. Photo 18 The first part of routing the top stitch thread is the small horizontal bar in the middle of the machine and the onto the tension adjuster. Photo 19 Close up view of the horizontal bar. Typically only one loop is needed. Tension Adjuster See Photos 20 & 21. Thread is further routed to the Tension Adjuster which looks like two disks, but really is one disk and a hair pin spring. This adjuster has its own bar where the threaded is routed much like the bar shown in Photo19. Thread goes counterclockwise over the top and between the two disks, then down (clockwise) to catch the hairspring and pulled up to the arm. Screwing the knurled thumb nut clockwise increases the pressure on the thread. Photo 20 The top stitch tension adjuster has it own bar (on the right) to route the thread through before going onto the disks. Photo 21 Close up view of the tension adjuster. Thread is routed counterclockwise between the upper disk pair and then down (clockwise) over the hair spring. When the presser foot lever is raised, the tension disks are separated making it easier to route the thread through the adjuster. The serrated thumb nut is the means to adjust the tension. Thread Routing to the Needle After leaving the tension adjuster, thread is routed upward through a special clip, the hole in the arm above the clip, down to another clip as shown in Photo 22. These special clips have a unique hook shape where a tightly stretched thread can run through the hook without having to "thread" it through the hole. The thread is further routed through the special hook, a pressure holder, and hook as shown in Photo 23. These hooks are like the previous hooks where under tension the thread can be pulled in to the hook. The little Tab is a spring loaded and a simple push of your thumb on the left side pivots the Tab up to pull the thread down the right side. 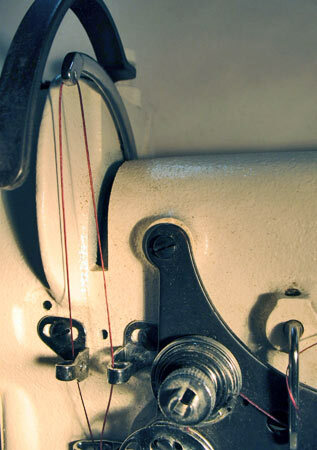 The final thread routing is through the loop on the needle foot (above the needle, Photo 24) and through the left side of the needle itself. A Needle Threader is an invaluable tool for getting the thread through the needle (Photos 25-27). Photo 22 Thread leaves the hair spring up through special hooks, the tension arm and back through another hook. These hooks have a unique profile where pulling the thread taunt between both hands, thread usually snaps into place. A little practice will make this easy. Photo 23 Another set of hooks and thread holder. The holder can be pushed in on the left side to pivot it to slide the thread under the right tab. The thread continues under the next hook (loop). Photo 24 Routing the thread continues through a small loop on the needle foot. There is no special hook here; you will have to push the end of the thread through the loop. Photo 25 A valuable tool is this needle threader. It has a hair like spring on the end that is pushed into the needle's hole. Photo 26 Close up view of the needle threader pushed through the needle's hole. Once through needle, the thread is slipped into the hair spring. Photo 27 The threader is pulled through the needle's hole pulling the thread with it. This usually is easier than trying to push the thread through the needle. 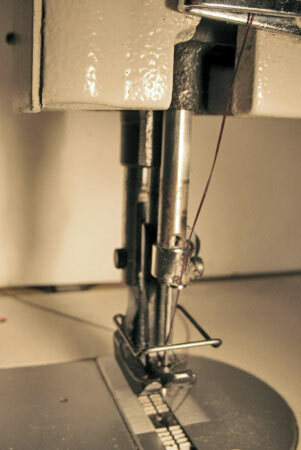 One more step is necessary to ready the machine for stitching: Pulling up the bobbin thread. Move the hand wheel forward (and only forward, never back) to move the needle down and up for one stroke. 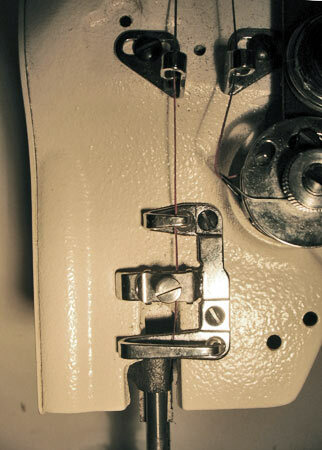 Lifting the presser foot (either hand lever or knee lift) reveals the top stitch and bobbin threads. Using a small screw driver, dental pick, or small scissor, pull both threads back behind the foot/needle foot (Photo 28). Photo 28 Close up view of the presser foot and needle foot with the needle on the down stroke. The thread is routed through the hole at the bottom of the needle on the left side. Note the groove on the side of the needle. This is where the thread will ride in during each stitch. 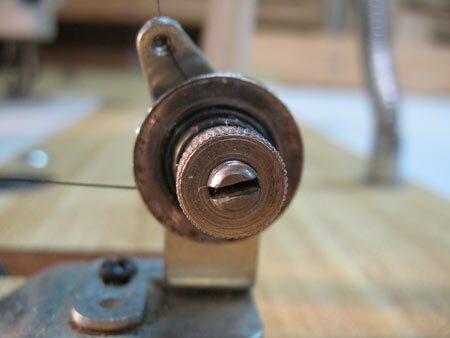 Shown here the presser foot is raised after one needle stroke to catch the bobbin thread and was pulled up and then pulled back behind the presser foot. Both top stitch and bobbin threads should be in the pulled back position before starting any stitching. Shuttle Cover The shuttle cover slides sideways to reveal the Bobbin Case. The cover should always be closed when operating the machine (Photo 28). Table and Lubrication A sewing machine head needs ample lubrication at various points. Most lubrication is done via a light oil to areas having felt wicks that retain the oil and dispense it slowly to the moving parts. Photos 29 & 30 show red marked points where this Juki machine should be oiled per the manufacturer's instructions. Other oil reservoirs may be included in your particular machine. Be sure to check the manual carefully. Ample lubrication is necessary, just exercise care in not over oiling the machine. Too much oil fly off the machine and get into your upholstery project and possibly staining it permanently. 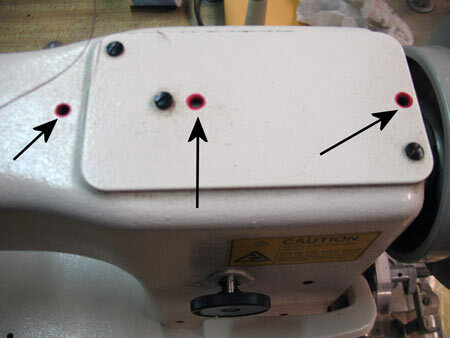 Photo 29 This JUKI machine includes red marks at select holes to aid in lubricating your machine. Use the recommended oil and use what is required. Too much oil can splatter onto your work. Refer to your owner's manual for specific lubrication information. Photo 30 Additional lubrication points are shown. This cover can be removed for lubrication and inspection. 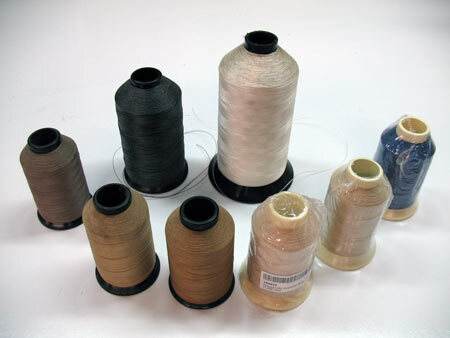 Thread Thread available from the upholstery industry comes in different compositions, colors and sizes (Photo 31). Composition can be Nylon or Bonded Nylon, Cotton and Polyester. There are different terminologies for thread size: V, (T) and Ticket. This Thread and Needle Chart from Toledo Industrial Sewing machines provides a good reference. V69 and V92 are commonly used for stitching seams together and the larger thread sizes can be used for top stitching, an application where a thick thread is desired to make a stronger stitch appearance such as on a door panel. Superior Threads offers a Thread Guide that shows thread sizes. Photo 31 Various colors of thread are shown in cones. The large cone of white is a nylon where as the small ones are poly cotton blend. Unique colors are usually offered in smaller cones. 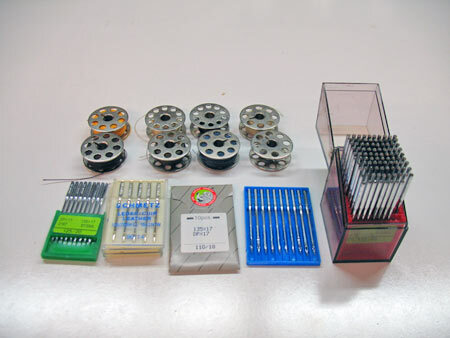 Needles and Bobbins You will need an assortment of needles and bobbins for your projects. Most are sold in small packages of 12 or a full box of 100. Same goes for bobbins. Purchase a few dozen and have them on hand. You will want to wind several bobbins of each color required for your project. You may not use them all immediately, but you don't want to have to interrupt your sewing in the middle of a project to wind a bobbin. (Photo 32). Photo 32 A sample of bobbins and needles. Needles come in a variety of sizes and point styles. Stitch Tension The tension of a seam's stitches is important. 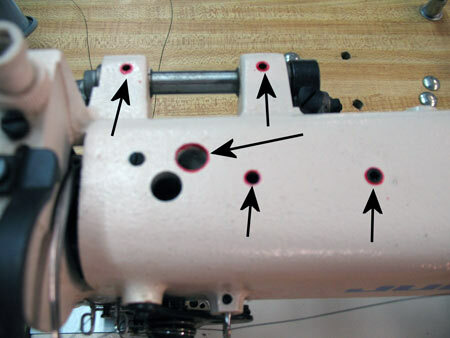 If the top tension is too tight, the thread from the bobbin will get pulled up to the top of the hole and will been seen. Conversely, if the top tension is not tight enough the bobbin's thread will be too tight and pull the top thread down. The perfect stitch is one where the top tension is matched against the bobbin's tension and the loop that is created is in the middle of the layers of material (Photo 33). This is especially important for two reasons. If the tension is low on either side the seam may pull apart, weaken or even break. Or, if different color threads are used for each side of the material, you don't want the different color thread from the back side showing up on the front side. 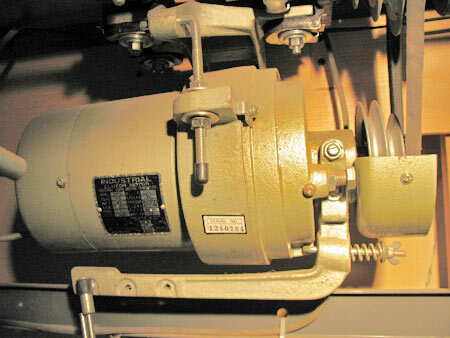 For more on bobbin and machine thread tension adjustments, visit Superior Thread's education section on adjusting bobbin tension and machine thread tension adjustments. Photo 33 Graphic showing the importance of stitch tension. Too much tension on top can pull the bottom thread too high (top of graphic) and like wise too little can cause the junction of the top and bottom threads to be at the bottom. Correct tension is where the junction of the two threads is in the middle (middle of graphic). Lock Stitch A lock stitch is usually a series of three stitches that are forward stitched, then reversed and again forward stitched. This is done using the Reversing Lever and for beginners, rotating the hand wheel. 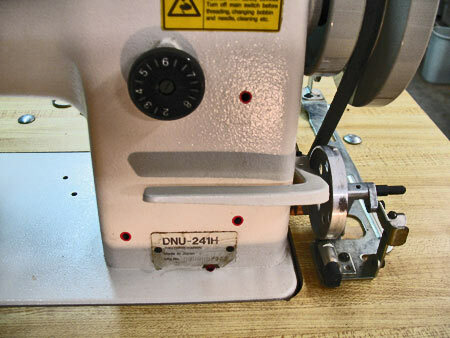 Once you get experience, it's possible to use the treadle and motor to do lock stitches and it goes pretty quickly once you get accustomed to the machine's operation. Stitch and Stitch length A Stitch is the pressing of a thread through a hole made by the needle into layers of material (leather, wool, vinyl, or other fabrics) and the thread is looped onto the thread in the bobbin and pulled up to make the next stitch. The Stitch Length is the distance (usually in millimeters) from one stitch to the next. The Stitch Length is usually fixed for a given sewing task. 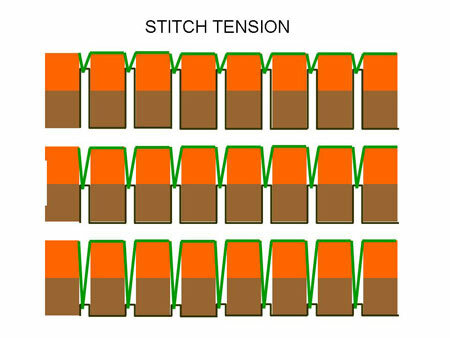 Shorter stitch lengths are used to join material together and a longer length is preferred for top stitching when it is likely to be seen. Attachments Many attachments are available to help make your job easier. Several different presser foot options are available for certain tasks. They include folders and special feet such as a welt foot or sometimes called a piping foot. A welt foot is one that has rounded edges on the bottom to make piping or welt assemblies. They come in a variety of sizes depending on the diameter of the desired piping. Welt Foot attachments usually come with their own Needle Foot as they are manufactured with close tolerance to each other. When changing a Presser Foot to a Welt Foot, change over all the components. They are manufactured as matched sets and should always be kept together. Other Presser Foot attachments include one for zippers, seams, and others. Be sure to check out specialty catalogs to become familiar with the many attachments that are available for your machine. Regular presser foot This is the most common sewing machine where the presser foot stays down all the time and the needle operates straight up and down and the Feed Dog drops below the shuttle cover and rises to pull the material backward the distance of one stitch length. The regular presser foot machine can tackle light weight fabrics. When the fabrics begin to get to heavy, the Feed Dog doesn't pull the material all the way and the stitch length is compromised, often causing the thread to bunch up. Walking needle This is not as common as the other type sewing machines. The presser foot stays down and the needle operates up and down and in a front to back oval motion. It is timed with the Feed Dog to pull the material backward the distance of one stitch length. 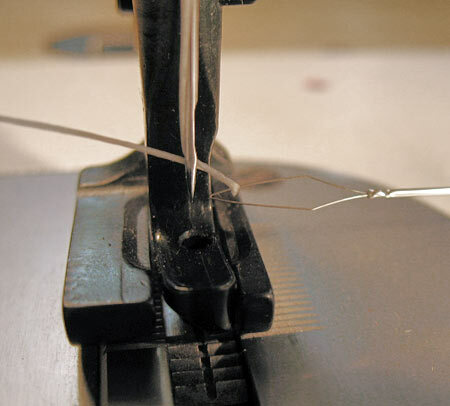 The walking needle machine uses the needle's lateral force to help pull the material through the stitch length. This is an improvement over the regular presser foot machine, but again can bunch up the thread if the material doesn't move all the way of the stitch length. Walking Foot (sometimes called a Compound Walking Foot). This is more common in the commercial upholstery trade as its capabilities can handle the thick materials frequently found when sewing multiple layers. The walking foot machine moves 1) the Feed Dog and 2) the Presser Foot up and down, 3) the Needle Foot and 4) the needle itself in a front to back oval motion in time with the motion of the Feed Dog. The intent of the walking foot is to raise the Presser Foot to relieve pressure of the material against the Shuttle cover plate and allow the Needle Foot to come down and grab the material from above and from below via the Feed Dog and make a single stitch all in time. 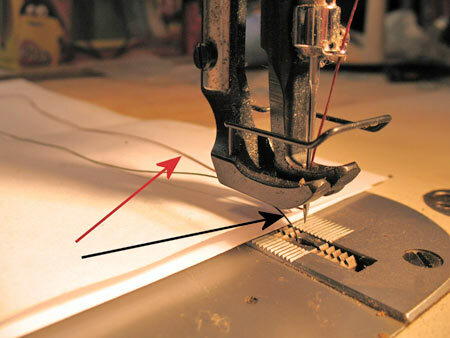 Using all four components (Presser Foot, Needle Foot, Feed Dog and Needle), the walking foot machine can sew stitches in the thickest of materials, like four to six layers of leather, heavy canvas (like sail boat sails), and in some cases even sew through cardboard. Practice, practice, practice. This can't be emphasized enough. 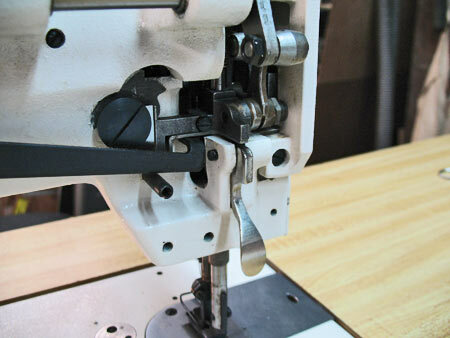 Making seams on your machine should be as easy and as comfortable as you grabbing a socket and ratchet and tightening a bolt. Practice with cloth or material similar to your project. Purchase close outs at your local fabric supplier. Do you care if the thick poly wool material has an image of "Darth Vader" on it? Plan your project and try to complete as many stitching (seams) tasks as possible. Winding bobbins, changing the Presser Foot, changing color or size of thread all take time. Try to combine as many tasks with a single set up. Some shops have dedicated machines set up to perform certain tasks like welting. Wind multiple bobbins with the thread you're using so that changing a bobbin is easy. Purchase a few dozen bobbins in your first sewing parts & accessories order and be sure to have wound bobbins on hand. When in doubt about your machine for things like needle size and thread routing, rely on the manual for your specific machine. Many machines are similar, but certain differences can effect the machine's performance. Quality of stitches and seams. Pay attention to the straightness of the stitches and the location of the stitch on the material. It's one thing to have a nice stitch that has proper tension on both sides and have an attractive stitch length, but if it wanders down the seam, it will look horrible. This is especially true for the French Seam which must have uniform dimensions on the straight and curved sections of the seam. Think about the task to be performed and what you need. If you are sewing the binding onto the edge of a pick up truck Tonneau cover that is about 25 linear feet around, make sure you start with a full bobbin. Running out of thread in the middle of stitching is an elementary mistake. Perform simple projects that force you to use the skills: practice, practice, practice. In Part 2 of our Upholstery Series, we cover basic stitches and techniques.